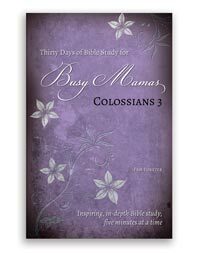 Even busy mamas can find time for Bible study if they can set aside just five minutes each day, and Pam Forster’s Thirty Days of Bible Study for Busy Mamas: Colossians 3 (Bible Study for Busy Mamas) is a wonderful tool for making this task simple, doable, and rewarding. As a homeschooling mother herself, Mrs. Forster understands the demands of caring for a home and family, and she addresses young mothers in a loving and encouraging way as she stresses the importance of setting aside some Bible study time. She compares time in God’s Word to nourishment: “Without God’s Word we will spiritually starve” (p. 2). As Mrs. Forster points out, this small amount of time devoted to Bible study will make us better mothers and is essential to equipping us to nurture our children. Thirty Days of Bible Study for Busy Mamas is divided into thirty short readings with assignments for digging deeper into the third chapter of the Book of Colossians. Along with this book, moms will need a Bible, a pen, and paper or a notebook, preferably gathered together in a place where they can study. If everything is ready, it will be easier to steal away five minutes of time.